You’ve done the right thing by buying a personal umbrella insurance policy to provide additional protection for yourself and your family in case of a crash with a driver who has little or no insurance. Or, maybe you just assumed that you had. The truth is, your umbrella policy may not protect you in the way, or to the extent, that you, and perhaps even your insurance agent, thought it would. Unfortunately, not all umbrella policies are the same. If you’ve been injured by a negligent driver and have questions about making a claim against the other driver’s and/or your own insurance policies, we highly recommend you contact an experienced personal injury attorney immediately. Your attorney will deal with insurance companies directly so you can focus on healing. Most really don’t understand what umbrella insurance does or does not cover. People may even wonder, “Do I need an umbrella insurance policy?” The answer is, “Yes.” We recommend umbrella coverage for all who can afford it, provided they buy the right kind of umbrella insurance policy. Umbrella policies typically provide additional liability coverage. For example, if a man with a $100,000 liability policy causes a car accident that kills or maims someone, he will end up in VERY BIG FINANCIAL TROUBLE. 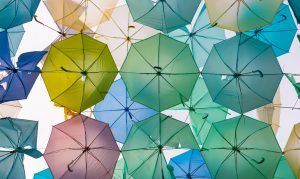 An umbrella policy can provide innocent victims additional coverage, up to $1 million, $2 million or more, depending on the limits of the policy purchased. The problem comes when people with an umbrella mistakenly assume they have that additional financial protection if they are injured by the negligence of other drivers. That isn’t the case with certain umbrella policies. While an umbrella policy may provide additional coverage against uninsured or underinsured motorists (UM/UIM), many do not. Cheaper umbrella insurance policies often cover only the personal liability of the insured, not injuries to an insured caused by an uninsured or underinsured driver. In fact, the first umbrella policy case handled by Suk Law Firm involved a young man who was rendered quadriplegic when another driver blew a stop sign and T-boned him, causing his truck to flip end-over-end. The insurer of his truck initially denied that its umbrella policy extended to UM/UIM coverage. It was only when the agent who sold the policy courageously said he would testify in court against his company that the company had told him the umbrella policy did cover UM/UIM situations, and that he sold it with that understanding, that the million-dollar umbrella policy was tendered. In a more recent case, however, a passenger who was seriously and permanently injured by an underinsured drunk driver had medical bills in excess of $350,000. She was out of work for more than a year. The umbrella policy she and her spouse owned was an “excess liability” policy, so their insurance company didn’t have to pay one penny in umbrella coverage for her medical expenses and lost wages. It is incredibly sad having to tell a seriously injured person or a grieving family that the $1 million umbrella policy they bought does not cover catastrophic injuries in an accident caused by an uninsured or underinsured motorist. Unfortunately, this kind of conversation happens much more frequently than anyone (except the insurer who has avoided coverage) would want. Even if you’re injured by a well-insured driver, however, the right kind of umbrella coverage can make a huge difference. Without it, even the most experienced personal injury lawyer is limited in what he can do for a client when the client cannot make a claim against his or her own $1 million umbrella policy. If you decide to purchase an umbrella policy, make sure you read the policy closely. Ask a lot of questions. You must be satisfied that the umbrella policy also covers UM/UIM accidents. Insurance agents in Minnesota have been held to be “mere ticket takers” by the Minnesota Appellate Courts and aren’t required to carefully investigate a client’s needs. Importantly, insurance agents don’t always know exactly what is included or excluded in the policies they sell, so you should have the agent show you the actual language, just to be sure. Fifteen percent of all drivers drive uninsured. Even more carry only minimal insurance. They cause accidents greatly disproportionate to their numbers. While you can buy a cheap “umbrella” full of holes and leaks, spend a little more for one that covers you fully. Call our office today if you’ve been injured in an accident by a negligent driver. Our law firm has recovered more than $125 million on behalf of victims and we are ready to assist you.